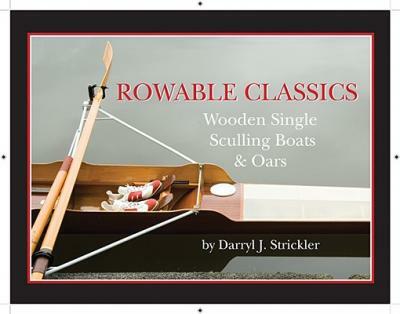 Simple Oars and Paddles, DIY Woodworking. Making Wooden Oars and Paddles. 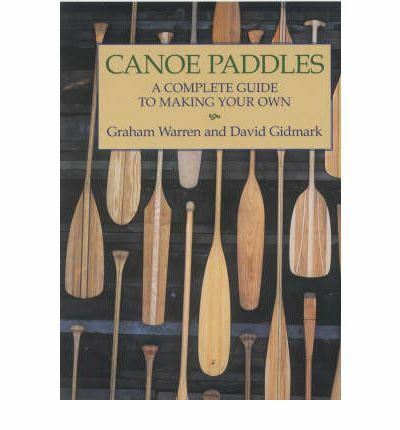 Simple wooden Oars and Paddles can easily be made at home. Not only is rowing and paddling great exercise, it is also a lovely quiet way to travel without any noisy, smelly, environmentally unsustainable motors. Finding the correct size of balanced wooden sweeps or paddles for your boat is not always easy. By making your own you can tailor them to your needs and make them as simple or ornate as you desire. One of the advantages of making your own set of oars is that you can make them oversize, try them out then, chop some off if necessary. But to start you will need a rough idea of how long they need to be. As a rough estimate measure the beam of the boat then double it. However this is a very rough estimate, the optimum length will depend on a number of other factors. Some of the factors to take into consideration are the boats freeboard, how much effort is required to move her and how directionally stable she is. For instance a nice fine dory will slip along so, you will need a long oar in order just to keep pace. At the other extreme an inflatable which isn’t directionally stable is better paddled with short fast strokes. And a heavy slow boat will require something strong and of medium length. It is also worth considering how much spring the shaft should have. 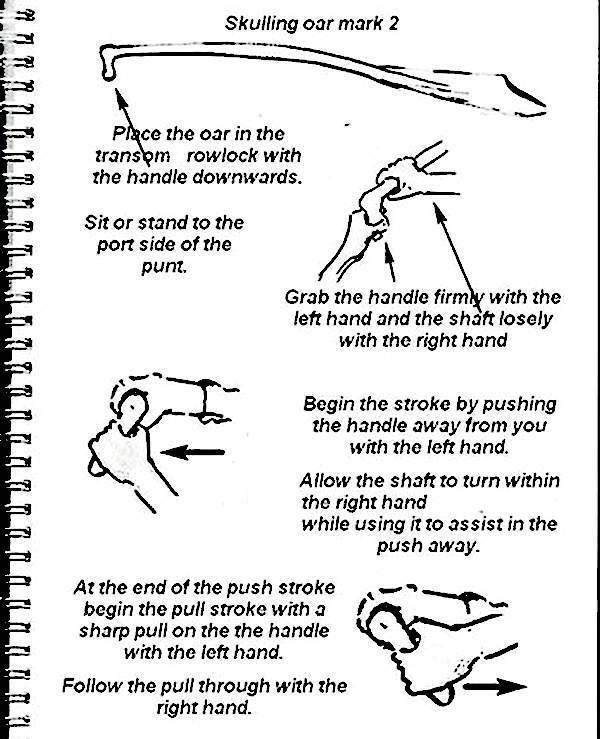 A stiff oar will be hard on the arms, however if it is too thin and whippy it may also be too fragile. 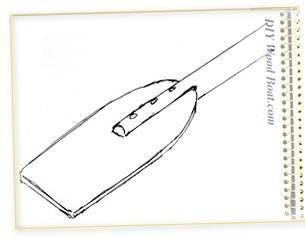 Before drawing out the shape of your oar or paddle consider the type of blade which is best for your needs. The natural assumption is that a large spooned blade would give more propulsion but this depends on the strength of the paddler. A long narrow blade will be less tiring, easier for distance rowing, will have less windage and better balance. And a flat blade will be easier to make. Many traditional sweeps and paddles had virtually no blades. A very adequate set of paddles can be built using just the minimum of basic handyman’s tools. However if you want to make yours from solid blanks it will be much easier if you have access to a band saw. The traditional tool for hollowing out a spooned blade is a 'bollow' plane, these have a convex sole and a blade curved to match. These can still be bought or you could even make your own wooden 'bollow', or adapt a small wooden block plane. There are also a variety of spoke shaves, rasps and draw knives such as those used by chair makers or coopers which are designed to scoop out. For shaping the shaft a plane or drawknife can be used to take off the corners and round off with sandpaper. The most popular wood for oars and paddles is spruce as it is the lightest. Fir and ash are more suitable when strength rather than weight is the priority. However it may be worth considering making your blades from a hardwood if they are likely to be subject to a lot of abuse. You will also need a good quality waterproof glue and something to make the ‘leathers’ from. ‘Leathers’ can, if you wish, be made form real leather however a neat binding of twine will do the job as will a length of suitably sized hose. Then for finishing, the wood will need protecting with varnish or wood oil, you could use paint but why hide that lovely wood. 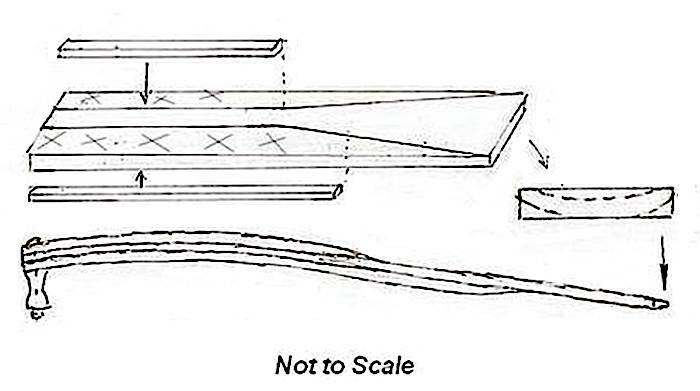 Here are three methods for making oars and paddles. The first is for making a pair from one piece of pine board. 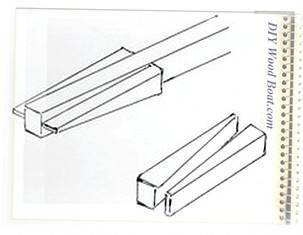 While this method may produce a pair well matched for weight and stiffness, it is rather wasteful of wood and won't be easy to cut without a band saw. And to get sufficient board, free of knots and with straight grain, you may have to buy much more than you need. Once cut, use a plane or draw knife and sander to work these pieces to their final shape. The square handle can be planed along the corners to make them eight sided then planed again to make them sixteen sided, finally sanded to produce a cylindrical shaft. A much easier and more economical method is to use lengths of 2x2inch /50x 50mm straight grained Spruce or a similar timber. 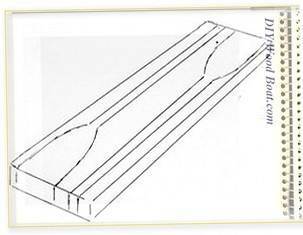 You need two lengths equal to the finished length of your oar or paddle. Plus two 2ft/600mm lengths for the blades. Slice the short lengths diagonally to give two wedges. Then clamp and glue these to the ends of the shafts. You can do some shaping before gluing but leave the edges flat for ease of clamping. Once the glue is set and the clamps are off, shape and taper but don’t leave a feathered edge. The end of the blade can be bound with a copper strip (don't use too many tacks) or it can bound with a binding of twine. Shape the last 6inch/ 150mm as a hand grip and add a ‘leather’ to the part which will go in the rowlock. A very cheap and simple paddle can be quickly knocked together from a scrap of plywood and a wooden pole. Simply cut a slot lengthwise in one end of the shaft. Draw the paddle shape by folding some stiff card, transfer to the plywood and cut out. Slot the blade into the slot in the shaft, drill three holes and through fasten. This is how I recently built a quick, easy and rough sculling paddle. The bend in the shaft at roughly 1/3 of the distance from the handle end and at roughly about 20 degrees from the blade. The bend was created while laminating the outer strips to the central shaped piece. It can also be used very easily one handed by just holding the handle. Finish off with a good overall sanding, but don’t smooth the handles too much, leave a little grip. If using varnish use three coats but don’t coat the handles, varnished handles are prone to causing blisters and calluses, it is better to soak them in something like Tung oil. Varnish over any twine binding as it will help hold it in place. Rowing and paddling is thirsty work. Sooner or later you are going to have to park your boat alongside the dock, so you can pay a visit to the local hostelry. 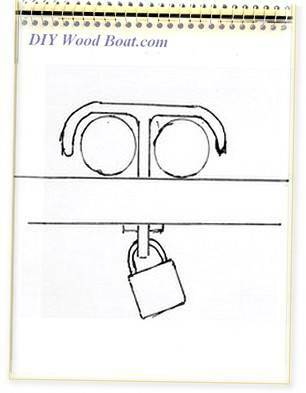 Most boaters in this day and age have come to terms with having to lock and secure their dingy with a padlock and some chain but what about the oars? You could take them with you but not many bar owners will welcome you carrying a pair of wet paddles. While you won’t stop a determined thief, a simple method of securing the oars will deter the prankster or opportunist. I'm a believer in keeping such securities relatively light so that any determined thief won’t do too much damage. Regardless of how cheaply or easily you have made your paddles, you don’t want to find them gone when you walk/stagger back to your boat.